You voted, and April's Corps Top Shot comes from Cpl. Paul Zellner. 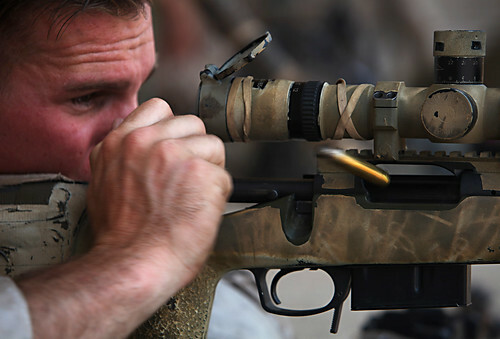 Zellner took this shot of a scout sniper practicing marksmanship skills with the Israeli Defense Force. TEL AVIV, Israel � Sgt. Eric D. Fraser, scout sniper, Ground Combat Element, Black Sea Rotational Force 12 ejects a spent cartridge while practicing designated marksmanship skills with soldiers from the Israeli Defense Force during Exercise Noble Shirley in Tel Aviv, Israel July 10. Noble Shirley is an annual exercise designed to exchange ideas, improve interoperability, understanding and cooperation between the Israeli Defense Force and United States military. Black Sea Rotational Force 12 is a Special-Purpose Marine Air-Ground Task Force with crisis response capabilities deployed to the Black Sea, Caucus and Balkans region to enhance interoperability and promote regional stability.